Posted 2:58 pm by Administrator & filed under News. University of Chicago President Robert J. Zimmer, Commissioner of Housing and Economic Development Andrew Mooney and 4th Ward Alderman Will Burns joined the Harper Court Partners, LLC team on Nov. 16 to celebrate the groundbreaking for the major new mixed-used development project in Hyde Park. The project team includes developers Dave Cocagne, Chris Dillion and Jon Zitzman, Hartshorne Plunkard Architecture, and McHugh Construction. The groundbreaking marked the official beginning of construction on the 3.3-acre Harper Court site, which will become home to a 150,000 SF office tower, a three-story retail building, a Hyatt Place Hotel, and new retail and dining options along with other amenities. Construction on that phase of the project is scheduled for completion in 2013. 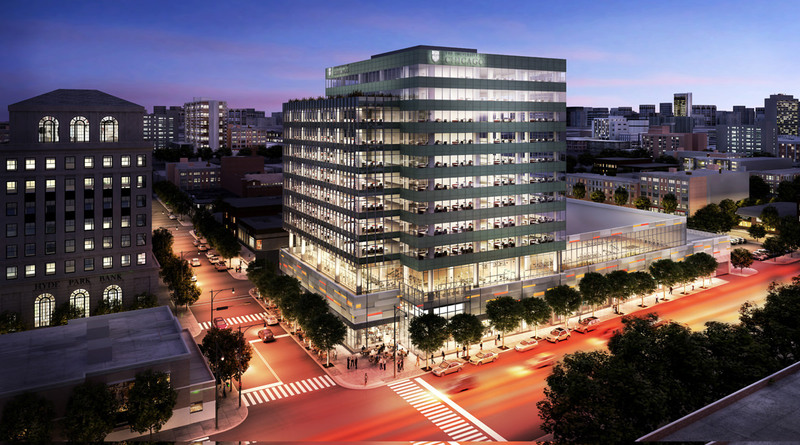 Tenants will include the University of Chicago, which executed a 150,000 SF lease for the Harper Court project’s office tower, and LA Fitness, one of the project’s retail anchors. SMART Hotels LLC will develop a 131-room Hyatt Place Hotel.